This is how the view towards Bargoed now looks. 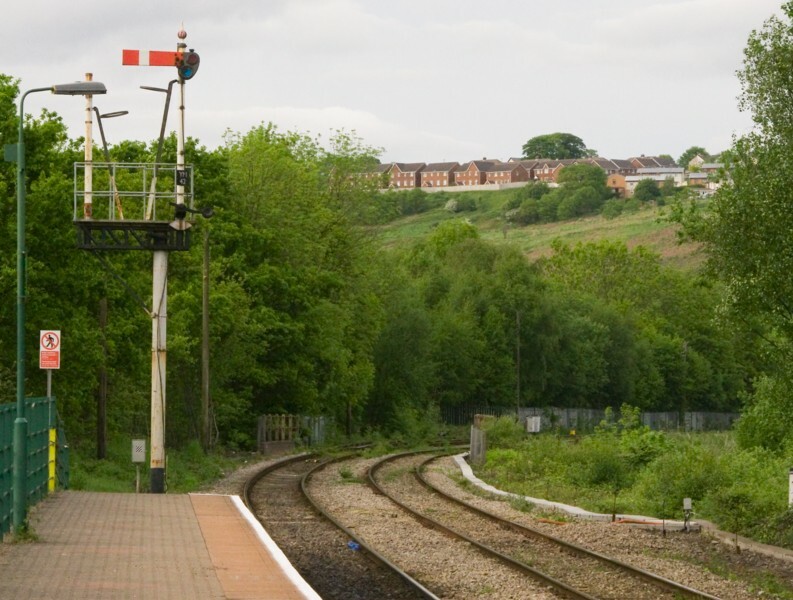 Some signalling improvements were done in the winter to enable a more frequent service on this line, and unfortunately some of the signals here were casualties. The former Cylla branch arm has now gone from the up starter, and the down outerhome no longer stands opposite it. 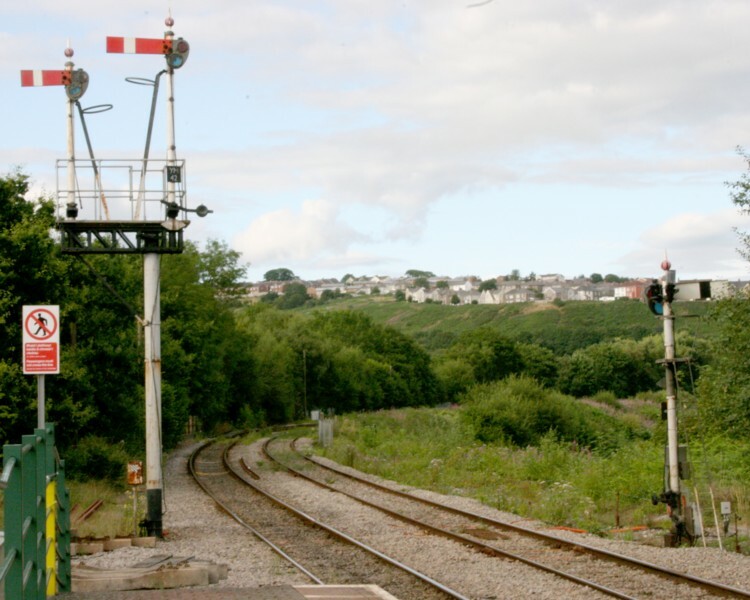 Nothing to the south of the station has changed, though - seven arms on display here, four of them three-foot goods signals. This is all the remnants there are of the Cylla connection and its ground frame. 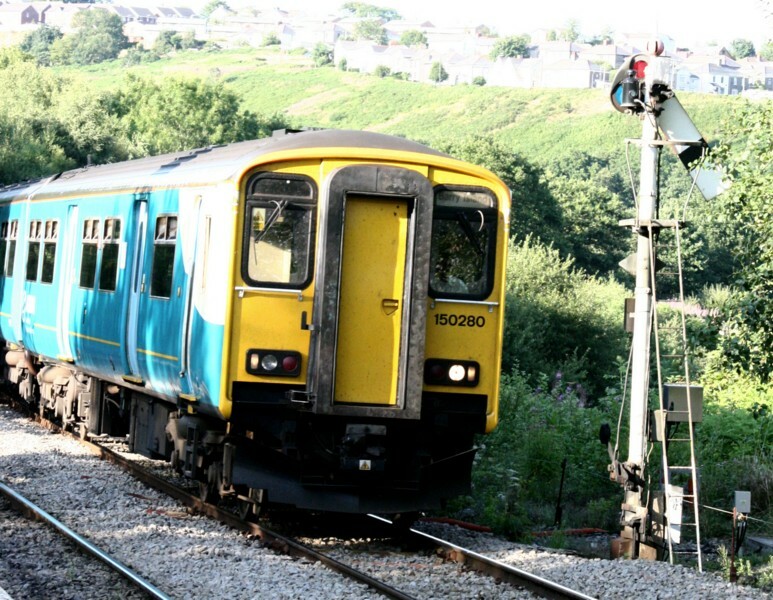 An up train departs for Rhymney. 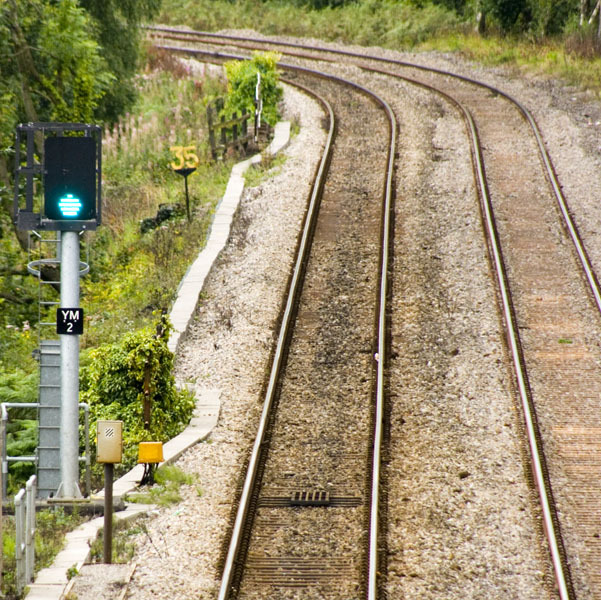 This LED signal is the new down outerhome, about half a mile above the station. 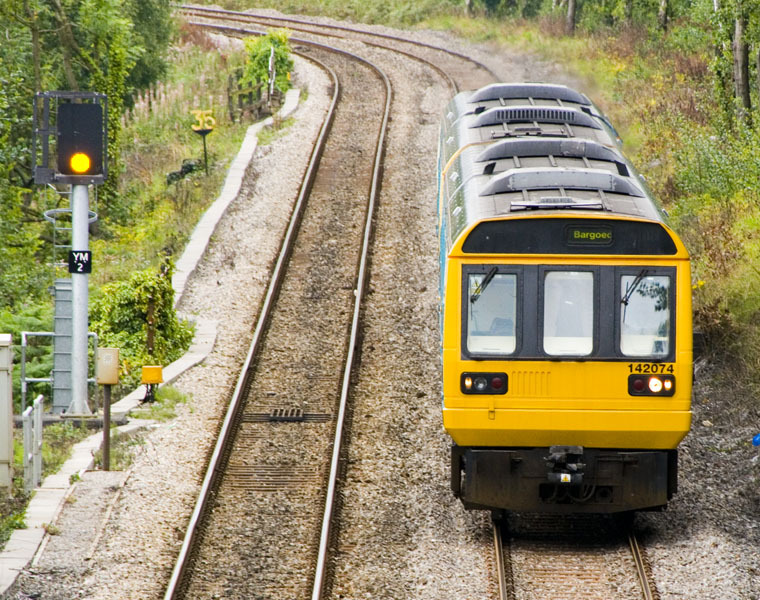 An up train passes the above signal. 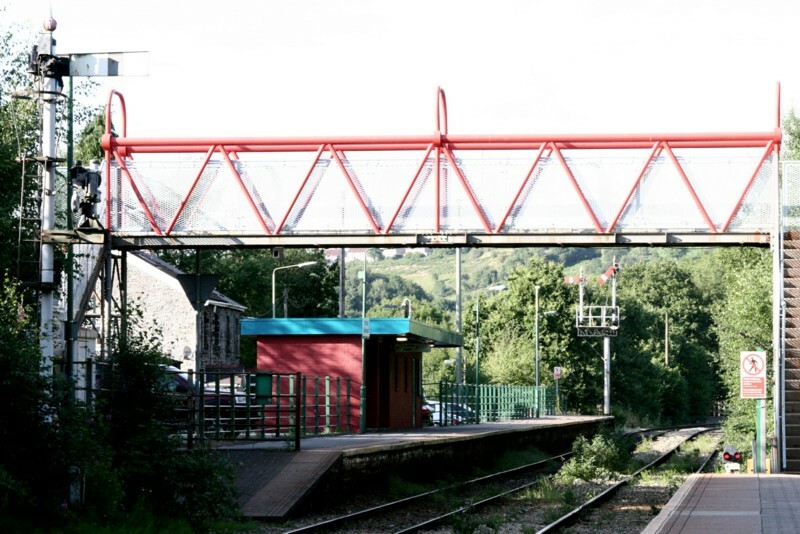 This was how the view towards Bargoed from the Up platform looked previously. 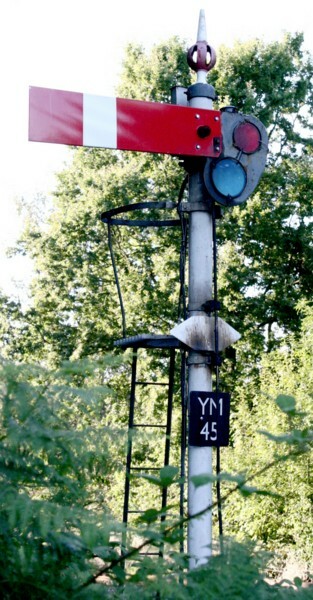 << The up starter (YM42) still sported the arm for the former branch even though the latter has been completely lifted. This was worked from a ground frame controlling the Cylla branch junction, but you can see even then the push-rod had been disconnected and the conterweight mechanism removed. 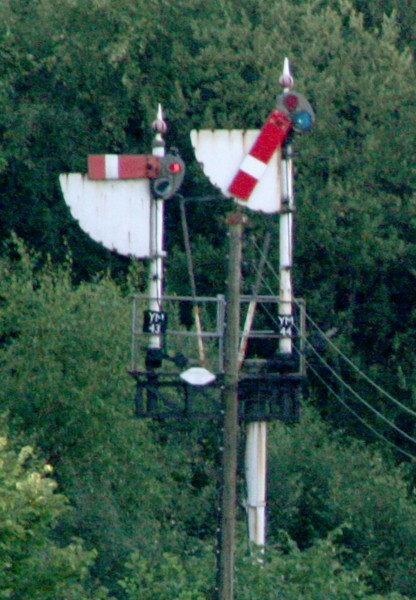 This is a distinct change from BR days, when that signal arm would have been immediately removed! This is the view back from the down platform, showing the staggered platform arrangment. 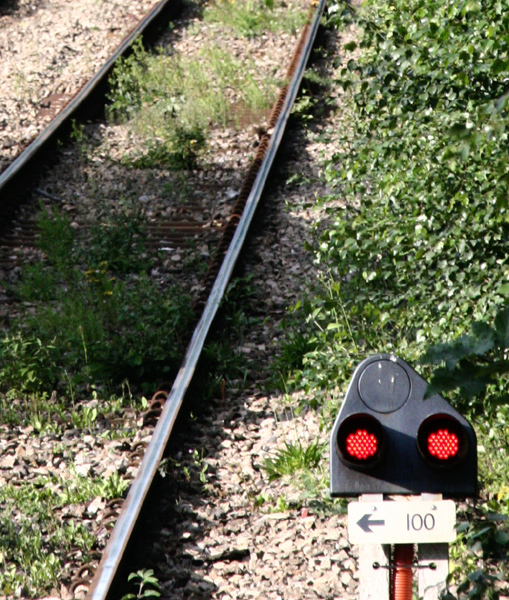 A modern-style limit-of-shunt marker (100) has been installed immediately in rear of the down platform. You can tell this is a fairly recent addition from the fact it has LED arrays. It has presumably been installed to protect the clearing point beyond the down outerhome. 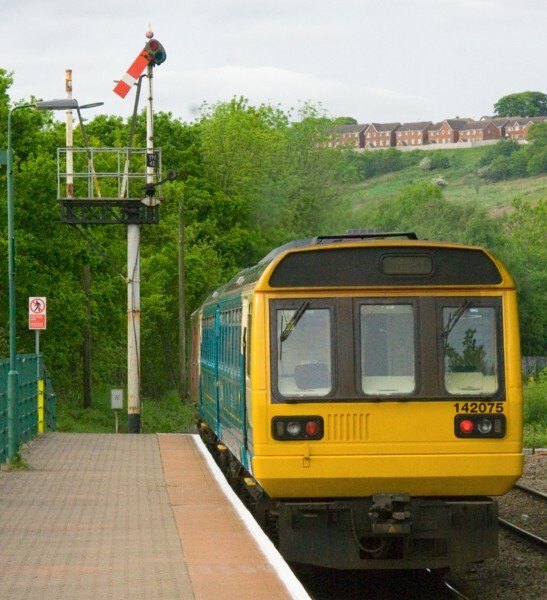 A train to Barry Island approaches the aforementioned down outerhome. This is the view towards Cardiff from the up platform. 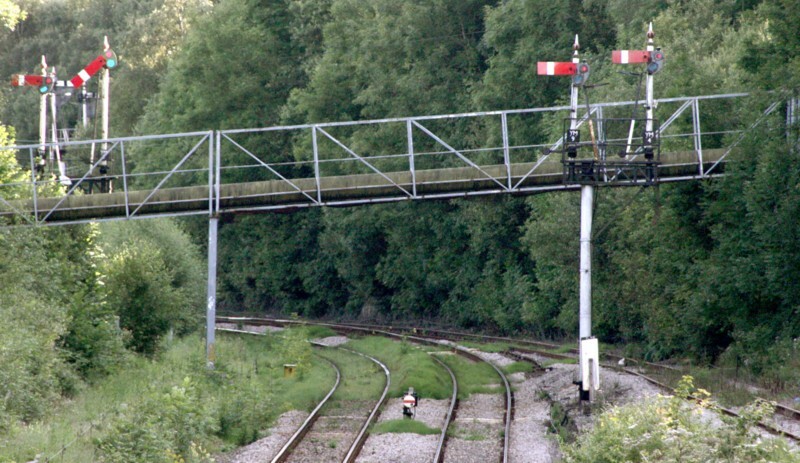 Signal YM5 was provided because trains coming down from the Cylla branch had to run down the up line to reach the trailing crossover beyond the Nelson branch connection after the far signals, though it also allows trains to reverse from the up platform. The bracketed disc reads to the down goods loop. 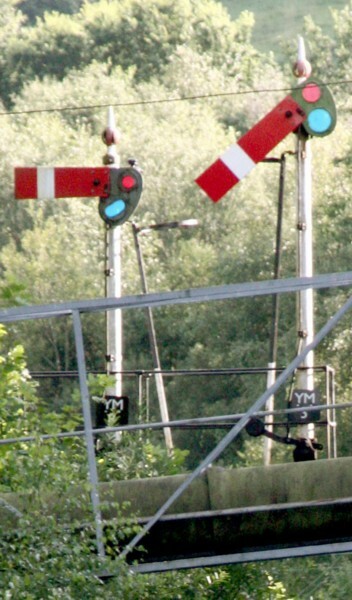 In the background you can see the down main and down Nelson branch innerhome brackets (more details below), each with separate arms for signalling moves onto the down loop. 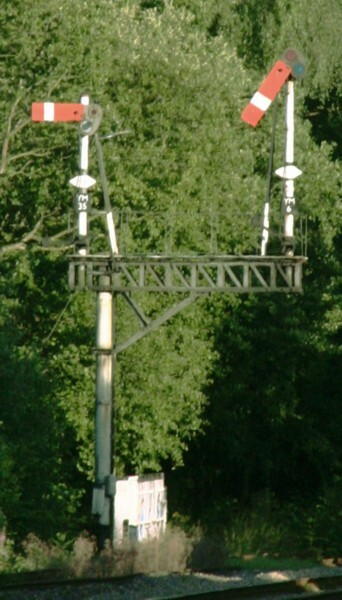 A closer view of these up signals, taken from the footbridge. 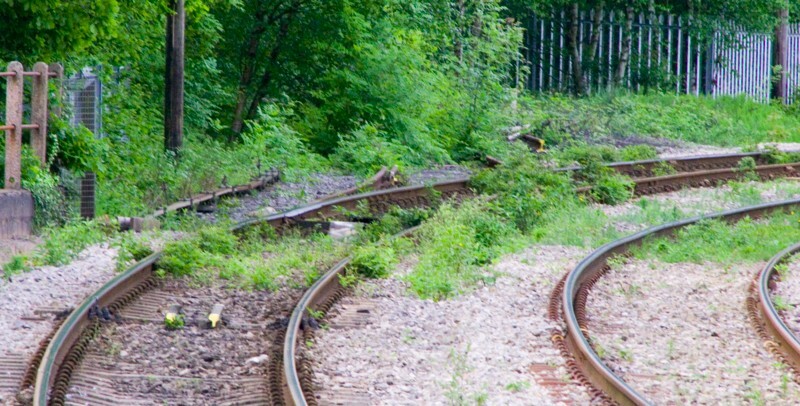 The Nelson branch converges from the right, the ground disc is for downward moves from the up line, and you can glimpse the rear of the up junction homes behind the down main innerhomes. << Down main to down loop (YM8) and down main home (YM3). 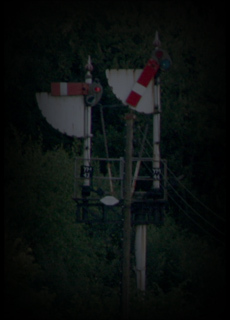 Sign for trains coming off the branch line. Staff and Ticket is a very rare form of single-line working nowadays. 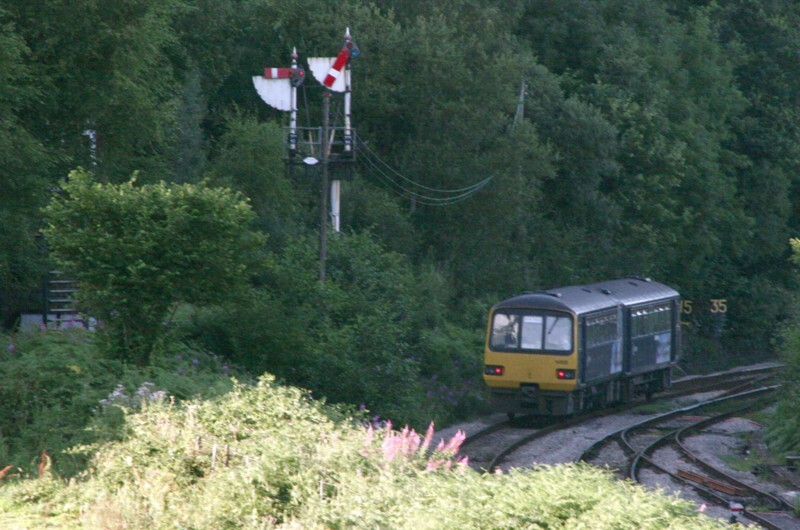 An up train approaches the junction innerhomes, seen from a vantage point some way south of the station. The trailing crossover, the entrace to the down loop, and a ground disc controlling reversing moves from the loop can also be seen. 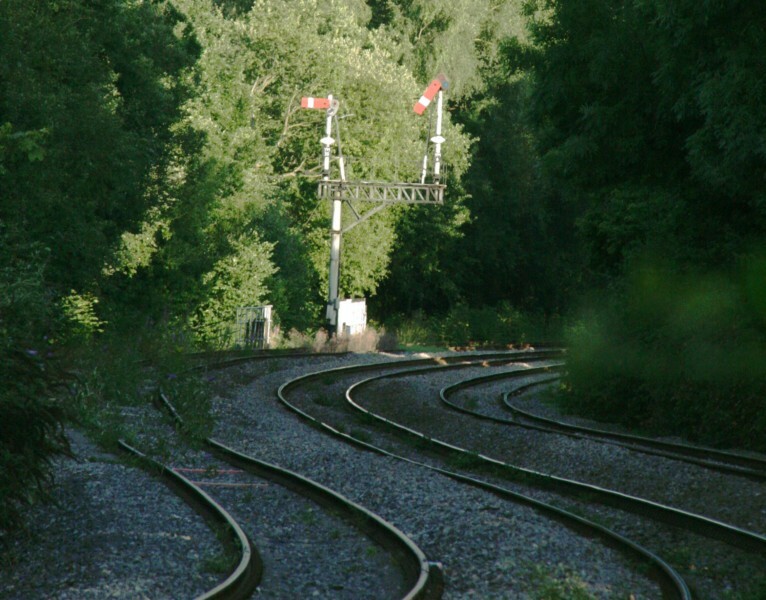 On the left is the signalbox, well concealed behind the trees. 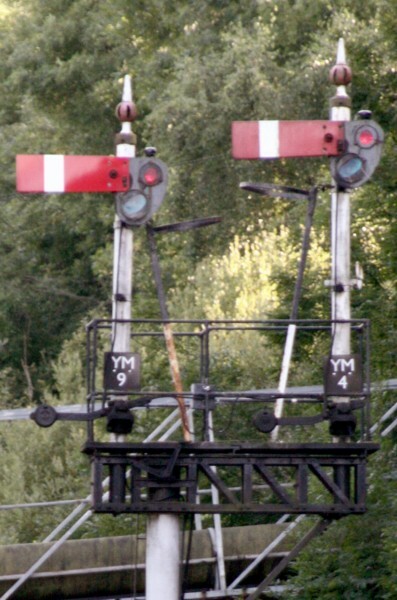 A closer shot of the junction signal: up main to up branch (YM43) and up main home (YM44). 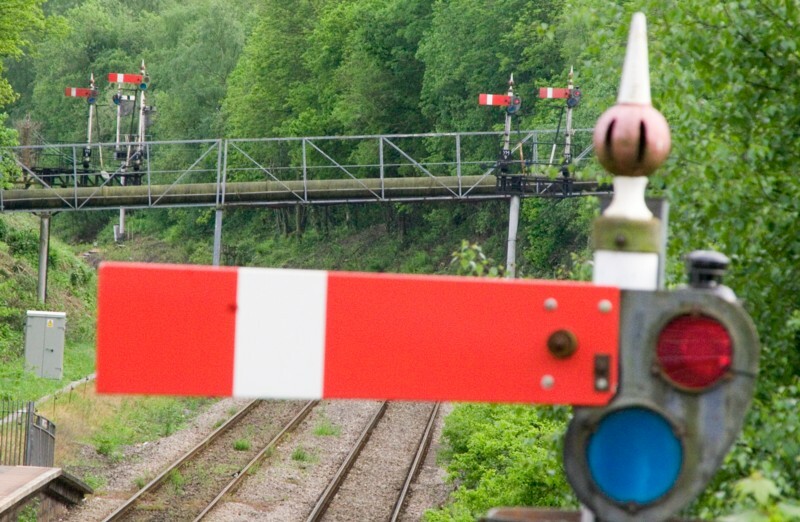 The GWR-style sighting boards behind the arms are quite a rarity these days. In the opposite direction are the down starting signals at the end of the loop. A closer view of the down loop to down main (YM35) and down main starter (YM6). 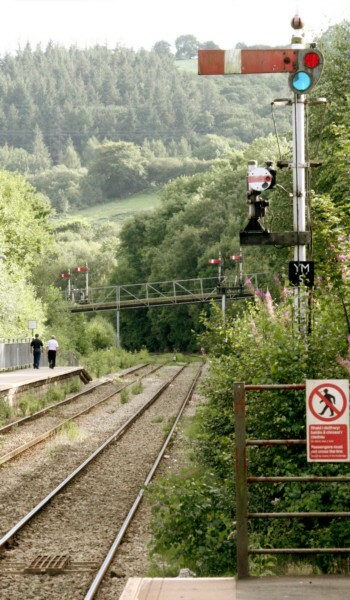 There is also an up outerhome (YM45) to allow Ystrad Mynach to accept an up train even if the previous one is still in the station or another move has been signalled across the junction. Thanks to Ian Hughes for sending me corrected details of the signal designations here. 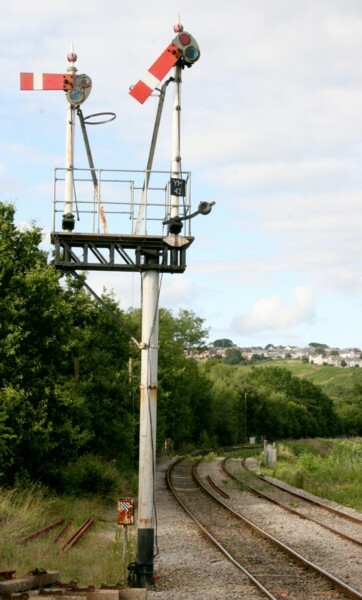 More information about Ystrad Mynach South signalbox can be found on the Signalling Notices site.